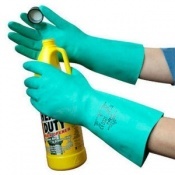 The Polyco Duo Plus 60 Double Dipped Latex Glove are chemical resistant safety gloves that perform well to protect against acids, alcohols and other chemicals. The Polyco Duo Plus 60 Double Dipped Latex Glove is double dipped for extra protection, and has a slip resistant pattern on the palm and fingers which helps to increase the level of grip especially in wet conditions. The anatomical shape of the Polyco Duo Plus 60 Double Dipped Latex Glove and the flexibility of the safety glove minimises hand fatigue to the user. The gloves also benefit from a soft cotton flock lining which absorbs perspiration and helps to keep hands cooler for longer. The Polyco Duo Plus 60 Double Dipped Latex Glove have been tested in accordance with EN 1186 making them suitable for food contact. 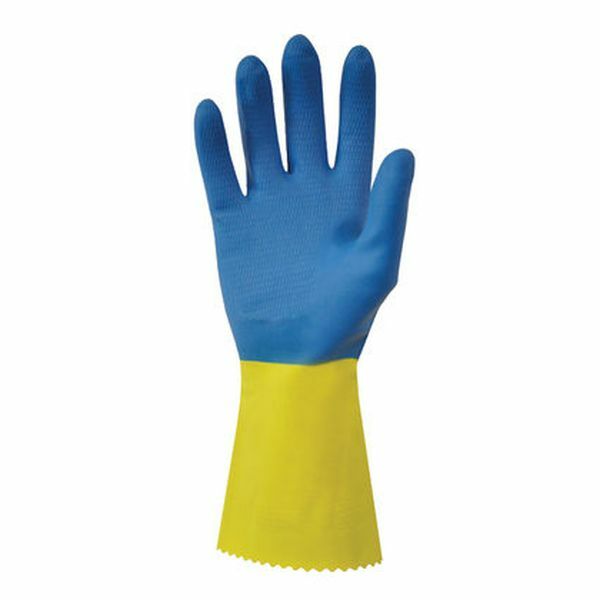 The product code for these gloves is RU560. The Polyco Duo Plus 60 Double Dipped Latex Glove offer protection against acids, alcohols and other chemicals including Acetone. Hydrochloric acid 10%, Methanol and Sodium hydroxide 40%. 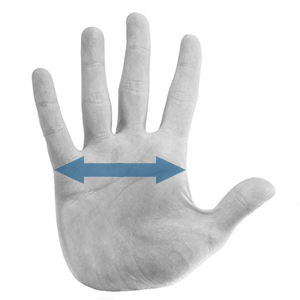 An anatomical shape and increased flexibility help to minimise hand fatigue which aids productivity. 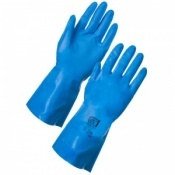 The Polyco Duo Plus 60 Double Dipped Latex Glove benefits from a slip resistant pattern on the palm and fingers. 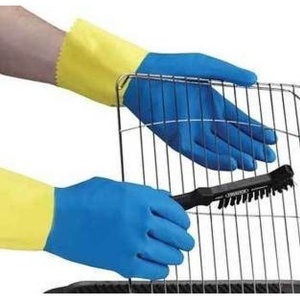 This offers excellent grip in both wet and dry conditions which is very important when handling potentially harmful substances. The Polyco Duo Plus 60 Double Dipped Latex Glove passes the leak test of EN 374-2. The Polyco Duo Plus Double Dipped Latex Gloves have been tested in accordance with EN 1186. They are suitable for use with all food categories in situations of short term, repeat contact and within the temperature range 5 degrees Celsius to 40 degrees Celsius. The Polyco Duo Plus 60 Double Dipped Latex Gloves are not suitable for individuals with latex allergy. Quality product, reasonably priced and quickly dispatched. Our end used orders them by name. Finds them a good fit/comfortable and easy to work in.